God alone is worthy of worship and deserves, yes even rightly demands, that we glorify Him alone. When you see God in His glory, even if only with “eyes of faith”, you cannot help but glorify Him. He alone is worthy of glory and honor and praise. A. Man’s chief end is to glorify God (1 Cor. 10:31), and to enjoy him for ever (Ps. 73:25-26). 2. Q. What rule has God given to direct us how we may glorify him? Glorifying God consists in four things: 1. Appreciation, 2. Adoration, 3. Affection, 4. Subjection. 1. Appreciation. To glorify God is to set God highest in our thoughts, and to have a venerable esteem of him. ‘Thou, Lord, art most high for evermore.’ (Psa. 92:8). ‘Thou art exalted far above all gods.’ (Psa. 97:9). There is in God all that may draw forth both wonder and delight; there is a constellation of all beauties. We glorify God, when we are God-admirers; admire his attributes, which are the glistering beams by which the divine nature shines forth; his promises which are the charter of free grace, and the spiritual cabinet where the pearl of price is hid; the noble effects of his power and wisdom in making the world, which is called ‘the work of his fingers’ (Psa. 8:3). To glorify God is to have God-admiring thoughts; to esteem him most excellent, and search for diamonds in this rock only. 2. Adoration. Glorifying God consists in adoration, or worship. ‘Give unto the Lord the glory due unto his name; worship the Lord in the beauty of holiness’ (Psa. 29:2). Divine worship must be such as God himself has appointed, else it is offering strange fire (Lev. 10:1). The Lord would have Moses make the tabernacle, ‘according to the pattern in the mount’ (Ex. 25:40). He must not leave out anything in the pattern, nor add to it. If God was so exact and curious about the place of worship, how exact will he be about the matter of his worship! Surely here everything must be according to the pattern prescribed in his word. 3. Affection. This is part of the glory we give to God, who counts himself glorified when he is loved (Deut. 6:5). ‘Thou shalt love the Lord thy God with all thy heart, and with all thy soul.’ This love is exuberant, not a few drops, but a stream. It is superlative; we give God the best of our love, the cream of it. It is intense and ardent. True saints are seraphims, burning in holy love to God. Thus to love God is to glorify him. He who is the chief of our happiness has the chief of our affections. 4. Subjection. This is when we dedicate ourselves to God, and stand ready dressed for his service. Thus the angels in heaven glorify him; they wait on his throne, and are ready to take a commission from him; therefore, they are represented by the cherubims with wings displayed, to show how swift they are in their obedience. We glorify God when we are devoted to his service; our head studies for him, our tongue pleads for him, and our hands relieve his members. The wise men that came to Christ did not only bow the knee to him, but presented him with gold and myrrh (Matt. 2:11). So we must not only bow the knee, give God worship, but bring presents of golden obedience. We glorify God when we stick at no service, when we fight under the banner of his gospel against an enemy, and say to him as David to King Saul, ‘Thy servant will go and fight with this Philistine’ (1 Sam. 17:32). Sola Scriptura, Sola Gratia, Sola Fide, Solus Christus, Soli Deo Gloria – these are the Five Solas, the outworking and fruit of the Protestant Reformation. Indeed we see that the reformation today can be found as an ongoing reality in the lives of those who believe and live by these doctrines. The reformation is alive. It is not a finished work of the past. It is not just an accomplishment of those great reformers and theologians of 500 years ago. It is present with us. It is here, in our midst, as we confess that the Scripture alone is our source of authority in all matters of faith and practice. In having a high view of Scripture we have a high view of God and understand that He has saved us by grace alone through faith alone in Jesus Christ alone. This He has done for His glory alone. 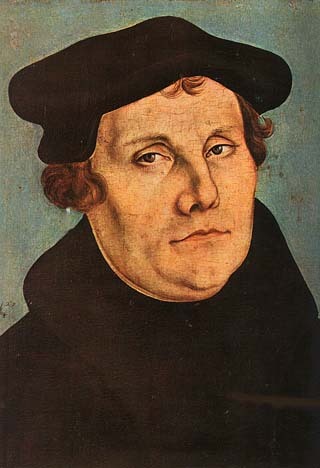 Where is the reformation today? Are you always reforming? Are you always striving to yield yourself as a living sacrifice to God, refusing to be conformed to this world but be transformed by renewing your mind in the Scriptures daily? Are you more and more like Jesus? Then you are always reforming. Take up your cross, having been crucified with Christ, and continue on, ever and always reforming until we see Jesus, for only then will the reformation be complete. Then we will be like Him to the everlasting glory of God. Amen.